5.9 earthquake hits the south-west Indian Ridge. In the Southern Hemisphere: Tropical cyclone 21s (Flamboyan), located approximately 847 nm southeast of Diego Garcia, is tracking south-southwestward at 08 knots. Thailand – Flash floods hit four villages in Ta Phraya district of this eastern provinces on Saturday, leaving numerous houses under water and damaging farmland and public utilities, officials said. The flash floods followed rainstorms that early Saturday began pounding Ta Phraya village in tambon Ta Phraya, and Khlong Phaeng, Khlong Chaeng and Khlong Nai Sai villages in tambon Thap Sadet. Forty-three houses, farmland and several roads were inundated. Kenya – At least 13 more people, including an infant, have been killed in separate floods related accidents, as heavy rains continue. In Tana River County, Governor Dhadho Godhana said 11 people were killed in floods. Most of the main roads leading to major towns and markets have been cut off, rendering the communities inaccessible and desperate to survive. Communities living along River Tana have lost crops to the floods and their farms and homesteads are submerged. British Columbia, Canada – Flooding in the B.C. Interior has triggered more evacuation orders and alerts, affecting hundreds of properties, as the province is poised to grapple with the effects of warming temperatures and an above-average snowpack. Russia’s Federal Forest Fire Center said on April 29 that more than 70 wildfires in the previous 24 hours had destroyed about 1,870 square kilometers of forest land in the country’s Far East. The center said on its website that the most difficult situation was in the Amur Region – including 370 square kilometers in the Khingan Nature Reserve. Fires also were reported in the Primorsky and Khabarovsk regions, and in the Jewish Autonomous region. The center said fires also raged through the Trans-Baikal, Omsk, and Bashkortostan regions. More than 2,800 people and 495 vehicles, including 25 aircraft, were involved in efforts to extinguish the blazes. The Mauritania Ministry of Health has reported a confirmed case of Crimean-Congo hemorrhagic fever in Ould Yengé commune, Guidimaka region located in the southern-most part of the country. The case-patient is a 58-year-old male herder from Elghabra locality who became ill on 16 April 2018 (reportedly) after tending to a sick cow days earlier. The number of chikungunya cases reported in Rio de Janeiro state during the first quarter of 2018 is nearly triple the number seen during the same period last year. From January to March of this year there were 4,262 notifications of chikungunya. Venezuela has the highest percentage increase of malaria cases in the world, according to the latest data from the World Health Organization. In fact, the number of cases in the country have increased by a factor of 10 since 2010. In 2010, the country had recorded 45,000 cases of malaria. By 2016, the rate was already 240,613. However, the data from Caracas was questioned and other estimates put it at 300,000 cases. Malaria figures in Uganda are alarming; with 2017 Ministry of Health statistics showing the disease still claims about 80,000 lives per year, equivalent to an average of 200 people every day. 5.4 earthquake hits the Hindu Kush, Afghanistan. In the Southern Hemisphere: Tropical cyclone 21s (Flamboyan), located approximately 953 nm east-southeast of Diego Garcia, is tracking southwestward at 15 knots. The first new species of “exploding ants” since 1935 has been discovered in the remote rainforests of Borneo, Thailand and Malaysia. 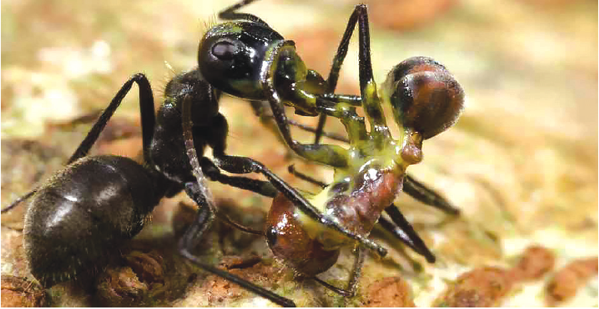 The insects give their lives in selfless acts that produce a burst of toxic yellow goo to kill invaders. Health officials in France reported an additional 428 biologically confirmed and probable dengue fever cases in one week. This brings the total laboratory confirmed or probable cases to 1816 since the beginning of the year. Fifty people required hospitalization for their illness since early January. In the Southern Hemisphere: Tropical cyclone 21s (Twenty-one), located approximately 1193 nm east of Diego Garcia, is tracking west-southwestward at 18 knots. Java – Extreme weather incidents are marking the ongoing shift from the rainy season to the dry season in Java, as various parts of the island have been hit with heavy rain and twisters, causing floods, landslides and lots of damage. Twisters lashed several areas in Central Java’s Wonogiri regency this week, collapsing 40 houses and damaging at least 60 others. Besides damaging houses, the tornado also knocked down numerous big trees. 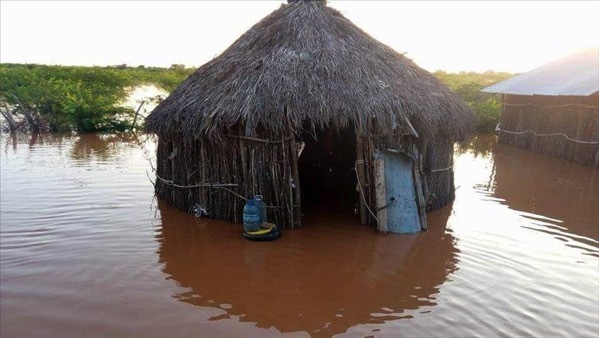 Kenya – Hundreds of thousands of people across Kenya, especially those settled close to Tana River in the northern part, were displaced by heavy floods in the country. According to Red Cross officials, the elderly, women and children are the most affected as their flimsy houses are either swept away or left waist-deep in water. According to a recent flood update by the United Nations Office for the Coordination of Humanitarian Affairs (OCHA), the floods have displaced more than 211,000 people and reportedly killed 72 people and injured 33 across Kenya since March 2018. OCHA said the floods have disrupted livelihoods, with at least 8,450 acres of farmland submerged in water and more than 6,000 livestock killed. The floods have destroyed houses and damaged infrastructure, such as roads and health facilities, it added. Somalia – Over 427,000 people have been affected by heavy flooding across Somalia in April. In the Baidoa town alone, about 174,000 people have been affected by flooding. Over half of their existing shelters can’t withstand heavy rains, and many have already been washed away. Many community latrines have been destroyed or filled with flood water. Forecasts predict more heavy rains in the coming week. Palestine – Two children were found dead in the city of Hevron in Judea, south of Jerusalem on Friday. Floods ravaged much of southern Israel Wednesday and Thursday, forcing closures of roads around the Arava region and parts of the Negev. Eilat Airport was also temporarily closed to air traffic on Thursday due to flooding. Officials in Pakistan’s Mohmand Agency are reporting a surge in infections with the parasite, Leishmania (leishmaniasis), according to a Daily Times report. To date, some 732 leishmaniasis cases have been reported from all three tehsils of Mohmand Agency. Plague is endemic in Madagascar, with hundreds of cases reported annually. Plague season typically lasts from Sept to April each year and the 2017-2018 season was quite remarkable. By the end of April 2018, some 2,671 cases of the plague had been recorded since the first case of the plague season was reported in August 2017. 5.0 earthquake hits the Bouvet Islands. Jordan – The Civil Defence Department (CDD) on Thursday rescued “hundreds” of people trapped by water floods in houses, vehicles and streets across the Kingdom. A heavy downpour flooded streets and neighbourhoods in the northern and central regions of the Kingdom. EU countries voted on Friday for a near-total ban on insecticides blamed for killing off bee populations, in what campaigners called a “beacon of hope” for the winged insects. Bees help pollinate 90 percent of the world’s major crops, but in recent years have been dying off from “colony collapse disorder,” a mysterious scourge blamed on mites, pesticides, virus, fungus, or a combination of these factors. The 28 European Union member states approved a ban on three neonicotinoid pesticides after the European food safety agency said in February that must uses of the chemicals posed a risk to honey bees and wild bees. Damage to fishing nets caused by dolphins is increasing across the Mediterranean as overfishing forces the marine mammals to compete more with humans for seafood. Damage to the typically small-scale fishing businesses are now costing thousands, or even tens of thousands, of dollars per year, according to University of Exeter researchers. Acoustic “pingers” used in an attempt to deter dolphins haven’t worked, and may have acted as “dinner bells” that actually attracted the ocean animals in some cases, the researchers found. Dutch researchers say they have found evidence of a kind of “heartbeat” in trees that causes them to change shape in a regular rhythm that is much shorter than a day-night cycle. András Zlinszky and colleague Anders Barfod at Aarhus University scanned 21 species of trees in windless and lightless conditions and found seesaw oscillations in branches that were most pronounced in magnolia trees. Branches move up and down an average of 0.6 inch during cycles that are 2 to 6 hours in duration. The pair thinks the pulses are evidence that trees have a “heartbeat” in which they actively squeeze water upward from their roots.